Anything actually happening on the trade war? Will India’s RBI tighten policy? Any inflation relief in Indonesia or the Philippines? So far everything has been limited to verbal skirmishes but no action. While we will continue to see more trade noise in the period ahead, markets will focus on hard data. And there is plenty on the calendar from China, Taiwan, Malaysia, and the Philippines. We expect sustained export strength in China and Taiwan with double-digit growth, but less so in the other two economies. After underperforming in 2017, China’s exports have been doing well this year with 14% year-to-date growth. On the other end is the Philippines with a 6% fall explaining the ongoing plight of the peso. 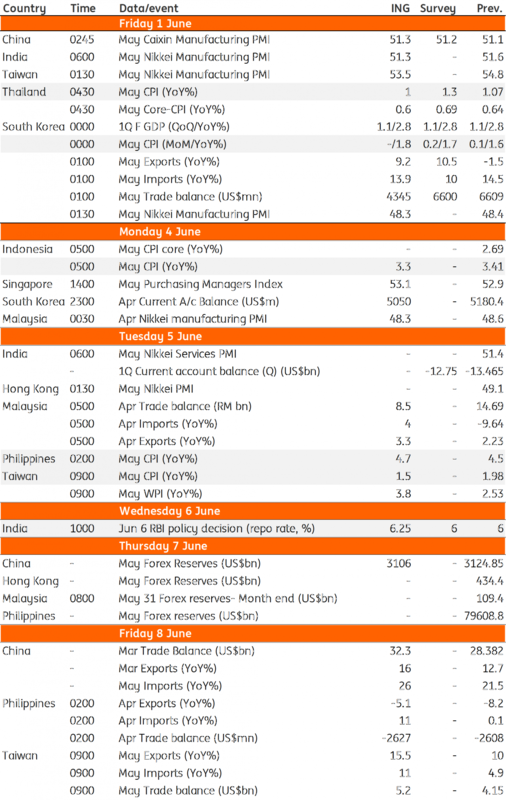 Meanwhile, China’s foreign exchange reserve data for May will provide a sense of capital outflows amid accelerated USD appreciation against major currencies, including the yuan. Our Greater China Economist, Iris Pang expects this to be reflected in a drawdown of reserves, by about $20bn a month. She also expects continued CNY depreciation ahead and has revised the USD/CNY forecast to 6.60 from 6.33 for 2018. We are in the consensus minority forecasting a rate hike at the June meeting next Wednesday. 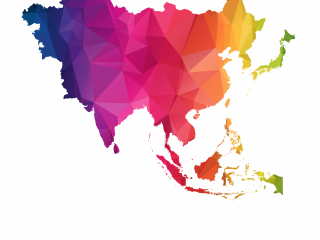 The emerging market central banks of Turkey, Indonesia, and the Philippines tightened policy recently as their currencies came under intense selling pressure from events around the world. The accelerated weakness of the rupee is likely to force the RBI on the same path. It’s still a close call as analysts’ consensus remains tilted towards Reserve Bank of India's (RBI) on-hold policy. We believe RBI policymakers are coming to terms with the need to pre-empt inflation pressure, which will worsen with the weakening currency. And the earlier they move, the better it will be. This is why we've brought forward our forecast timing of the first 25bp rate hike to June from August. Absent any policy support forthcoming, we will review our end-2018 USD/INR forecast of 68.3 for another upward revision. Not much based on our house forecasts. The double-whammy of higher oil prices and weak currencies will keep inflation elevated in both these economies. We think recent policy rate hikes by respective central banks are just the beginning of the tightening cycle. Our economist Joey Cuyegkeng now forecasts additional 50bp policy rate hikes by both the central banks in the rest of the year.